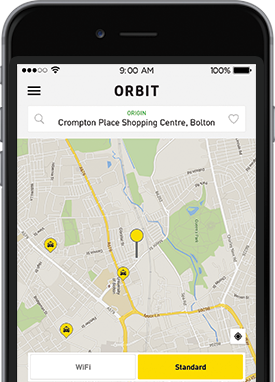 Travelling around the city just got simpler with Orbit. Book a cab and ride to your important business conference, your favourite cafe or shopping mall – the choice is yours – with just one tap. Orbit offers taxi for your every need, from regular cabs to luxury vehicles. Our cars are inspected for hygiene, safety and ease, which means quick, comfortable and reliable rides are at your fingertips. Your safety is our foremost priority. Every aspect of the Orbit’s travel experience has been envisioned around passenger’s safety and security. Passengers can also share their view with the driver feedback tool. Getting in and out of the city is a breeze with Orbit’s dependable and convenient rides. 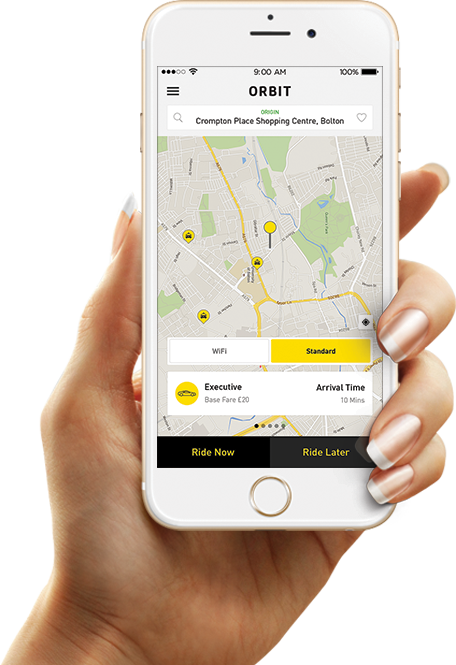 Whether you’re heading towards Bolton, Blackburn, Preston, Manchester or any airports in the UK – just choose your ride and set your location – and you’ll arrive at your destination, without a headache. What's more? When you arrive at your destination, just hop out, and make a hassle free payment with cash or card. In addition, there’s no need to tip the driver. Travelling around the town is just one tap away. Use Orbit to book a cab and make the best of time and comfort. Book a ride, set your destination and track your driver’s arrival on the map. Our chauffeur will arrive at your requested location within minutes to pick you up. Enjoy your ride with professional chauffeurs in a premium car of your choice. 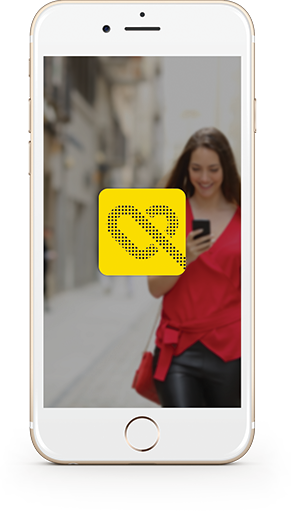 Book your taxi quickly, without any complications via the smartphone app. Our super reliable taxis are just seconds away. Select your desired payment option – card or cash – for a convenient and seamless ride experience. Orbit have transparent and fixed fares, listed online. Be assured of your fare and never haggle with drivers again on fares. Book a trip for later as per your convenience. We are always there when you need us and you can book us in advance. Your safety is important to us. Orbit’s drivers are well trained and trustworthy and are fully licensed and insured. Choose from a wide-range of premium and luxury cars to suit your needs. Sit back and enjoy your riding experience. Competitive rates along with a ride that you can trust. Orbit offers incredible customer-friendly ride rates, which you cannot overlook. Orbit, UK’s most popular mobile app for transportation ensures suitable, reliable and safe travel service to provide customers a hassle free journey. Thank you for getting in touch..! A private limited company incorporated and registered in England and Wales, under the company number 8613501. Haslam House Suite 16, Nortex Mill, 105 Chorley Old Road, Bolton, BL1 3AS, United Kingdom. © ORBIT INC 2016 ALL RIGHTS RESERVED.